This recipe really comes from a place of love. Now I will be honest this recipe was inspired by many others out on the interweb (like this one and this one) but I am sorry to say that when you are going grain and gluten free there is no chance you are going to get that gooey bready sugary BUN texture – there is no glue (ten) to make that happen. BUT these are a delicious muffin alternative with that spicey goodness and low in sugar and super kind to your body. And remember I pretty much get all my obscure ingredients like tapioca flour or vanilla powder from amazon so if in doubt check out my shop. 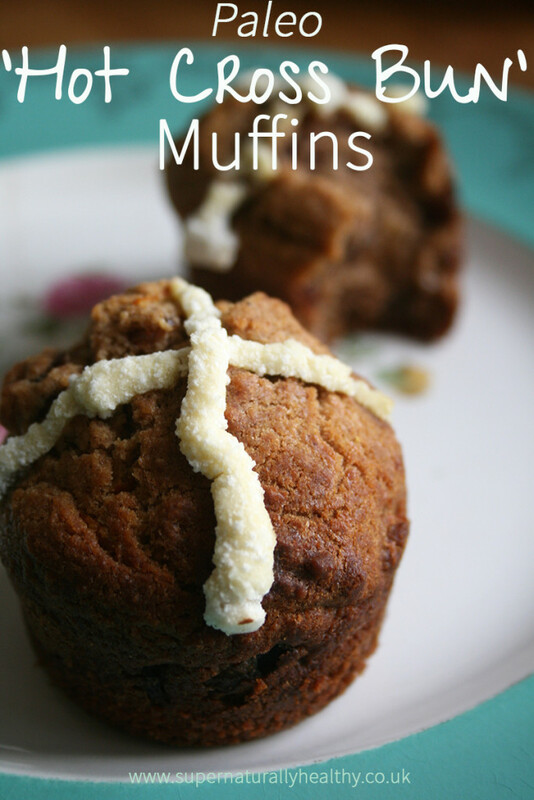 So enjoy the Easter festivities, the big J man himself (that is Jesus) and some healthier muffin that won’t leave you looking bloated and pregnant like Mary on Christmas eve. These are best eaten fresh on the day you make them. I left mine out uncovered for a day or so and they went stake:( But then discovered they make a great bread and butter muffin pudding! So I sliced up remaining muffins put it in a bowl and added a mixture of 2 beaten eggs with about 400ml of milk and vanilla and poured over the muffins and baked for about 30 mins and it was also yum. So too recipes in one! Preheat the oven at 180c and grease your muffin tray. Mix the almonds and tapcioa flour, bicarb, salt, vanilla, and spices in a bowl. Melt the butter and honey at a low tempurature in a pan. Allow to cool and add the orange zest to mixture. Beat the eggs and after making a well in the dry ingredients, add the besten eggs gradually to dry ingredients, stirring in gently. Then add the honey/butter liquids until fully combined. Stir in raisins. Fill muffin tray with 3/4 full with mixture. Place in oven for about 20-25min. Mix the tapicoa and coconut flour in a bowl and gradually add a tbsp of water at a time until a paste forms. Then fill a piping bag with the mixture ensuring it has not gotten too hard - if it has add a bit more water. 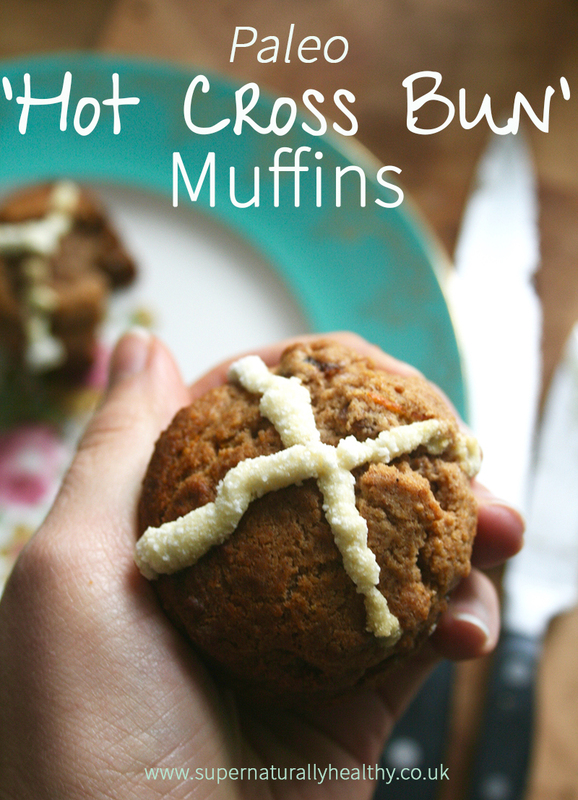 After about 15 mins, or once the muffins have risen, take out of the oven and use the piping bag to add a cross and then place in oven for another 10mins or until fully cooked. + I have not tried this recipe with any other flour but would guess that it would work with just 300g of ground almonds - although this would change the texture. + These need to be eat FRESH on the day baked, ideally straight from oven as they will go stale after a day. + Feel free to use coconut oil instead of butter to make it dairy free - this will just add a slight coconutty taste unless you use odourless coconut oil. What is your favourite Easter Treat?